The Conqueror battle dagger is a superb expression in steel. The Conqueror is named for William the Conqueror, one of the greatest military commanders of the Middle Ages, who let the Norman Invasion and defeated the English at the Battle of Hastings in 1066. The knife’s free-form sculptured shape is perfectly balanced, complete in its flow and form as a work of art—edged art of enduring excellence. Though while still a piece of sculpture, the knife immediately reveals its capabilities when called to action. 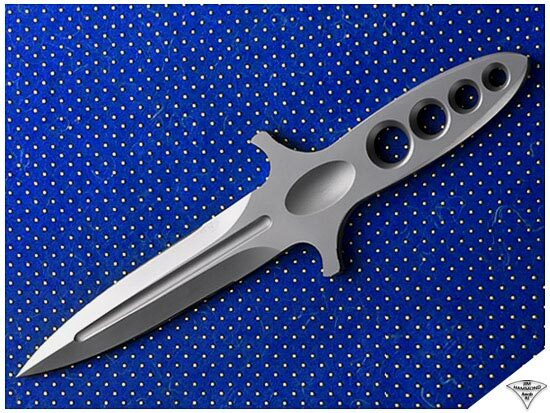 BLADE…The double edge blade of the Conqueror, ground from 3/8” 440-C stainless steel, is hollow ground for cutting ease while still retaining maximum strength. The hollow ground fuller groove down the spine adds beauty of line and serve to reduce drag along the blade. HANDLE…The Conqueror handle is a blend of several key design features, all of which contribute to optimum comfort and control during use. The countersunk holes of graduated diameters, from 3/8” to ¾”, serve a multi-purpose. First, they lighten the handle, bringing the balance point of the knife on a line through the guard. Second, the countersunk shoulders help orient the hand, comfortably securing its grip on the knife during use. Third, the holes allow the knife to be lashed and secured in a variety of ways. Fourth, one of the holes can serve as the pivot point for a quick rotation between a forward and a reverse grip. Artistically beveled edges flow around the handle area on all four edges that touch the palm for maximum comfort. The area for the thumb behind the guard tips is left flat and squared with serrations being added for additional control. The handle shape of the Conqueror allows for a variety of grip positions—fencers, hammer/modified hammer, and reverse. The elliptical shaped thumb depressions are designed, no only as artistic touches of visual flair, but to improve grip stability when the knife is held in the T-grip position. An early example of this fighting knife feature was the “thumb print” on the ricasso of the famous V-42 dagger of the First Special Service Force, the forerunner of today’s Special Forces. From the T-grip, the knife can be rapidly rotated to a reverse position. The Conqueror has a micro-glass bead-blast finish overall as standard, providing a non-reflective surface of classic elegance and beauty. Several studies in contrast have been made with this knife, incorporating multiple surface finishes of a micro-glass bead-blast, hand-rubbed satin and a mirror, all on the same piece. For complete details regarding sheath choices and options, click on the “Sheath Choices” button in the ‘Dimensions and Details’ section below. The Conqueror battle dagger is a limited edition series of only 50 knives. The knives will be serial numbered “1 of 50”, 2 of 50”, etc.